I can’t believe it’s October already. Ahhh! Once again, National Novel Writing Month looms on my horizon. 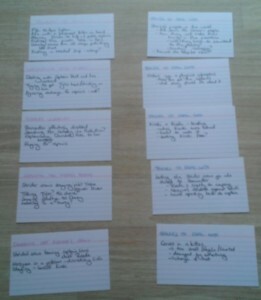 That means that I have a 50,000-word project to plan, and a region’s events and activities and giveaways to organise. Luckily, my co-ML and I have been working on the latter for the last few months, taking our time. As October tipped into being, we’re almost set up: we only have a couple of details left to shake out, and then we’ll be completely set! Our write-in calendar is the easiest of the organisation. We’ve got it down to a well-oiled machine now, with our awesome venue and a schedule that is a little crazy (our weekend write-ins run for 10 hours each) but one that we know works for us and our writers. One of the biggest events we’re doing this year is the Kick-off Party. After the success of last year’s evening Halloween party with the writing start at midnight on 1st November, we were determined to make it even better this year. It’s our last weekend Halloween for a few years, so we’re making the most of it! One thing we wanted to do was find a better place to hold the KoP this year. Last year’s was good but there was room for improvement. So, my co-ML and I had a chat with the manager of our wonderful write-in venue, the Coffee Club at Milton (affectionately referred to as the CCM). They usually close up around 9 or 10pm, but when we explained what we wanted to do, the manager had no hesitation at all: she offered to stay open to 2am. So we can do the party and the midnight start, right in our usual NaNo home! It’s all set up and ready to go. I can’t wait! The other big thing we’re doing this year is trying something different with our Writers’ Retreat. After our experiences and feedback last year, we decided that it wasn’t going to work again, so it was time for something new. We needed something low-cost but loads of fun. This year, we’ve decided to do an Overnight Write-in instead. What does that mean? It means piling as many people as possible into my house for a weekend, telling them to bring their own pillows so they can crash on couches/mattresses/floors, and getting catering in to feed them all. The catering and some of the details are still a WIP, but it’s coming along. I should be ready to publicise the details and take bookings soon. Once that’s done, we’re ready to rumble! The only other bits we have left to do is to take a trip to the candy warehouse to bulk-buy in the candy we need (writers need sugar – and caffeine, but we only supply sugar), and put together the party bags and lanyards for the Kick-off Party. That’s lined up for a couple of weeks’ time. Some quality testing of the candy may be involved. It feels good to be an organised ML. But what about what I’m writing this year? Weeeell… I’m getting there. I have been tossing up what to do with my NaNo project this year, and as I suspected when I started my Starwalker hiatus, getting Book 5 underway is going to be my focus. While I do largely write without detailed plans, I want to start Book 5 off with direction and purpose, particularly after my Starwalker Book 4 experiences. So, at our regular write-in this month (which happened on Saturday 3rd October), I sat down and noodled out the next part of Starry’s journey. This led to the collection of 10 notecards you see depicted in this post: 5 plot-progress cards, picking out the major sections and some of the details that will be in each one; and 5 ‘things to deal with’ cards, to identify the over-arcing issues that Starry and her crew need to handle somewhere in all that plot stuff. I didn’t intend for them to be 5 each; I just wrote up everything that was buzzing around in my head. Sometimes things just come out weirdly symmetrical. 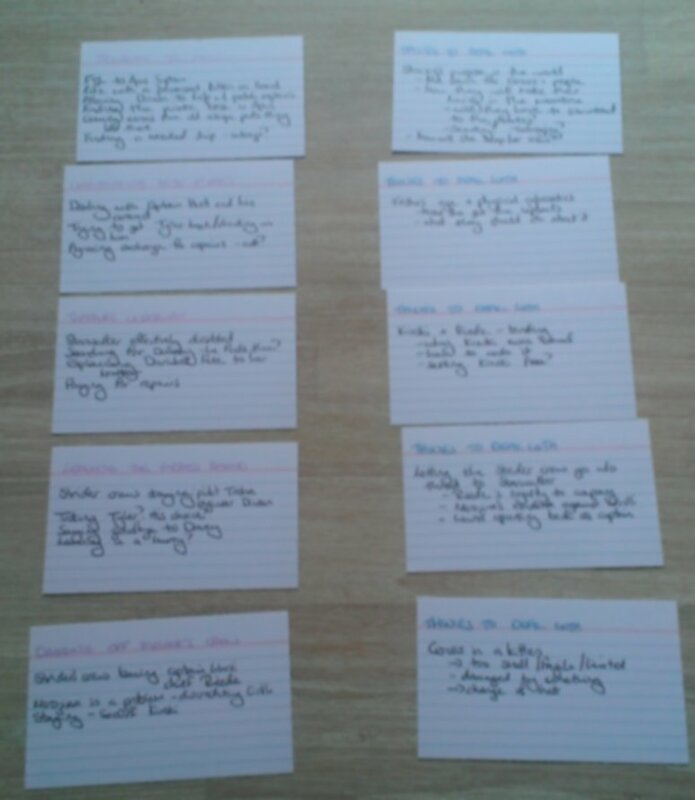 Be assured that those cards are actually all different sizes: some plot points and issues are bigger than others. Looking at it now, I have no idea if I can get through all of that in 50,000 words. I’m not sure if that is all of Book 5 but I suspect it might be, and that means… there is likely to be a Book 6. Wow. So much to write! I’ve set up a brand new Scrivener project to write it in (I’m transferring over to Scrivener from yWriter, now that I’m working primarily on a Mac). All I have left to do is read over the end of Book 4 again to get my head in the right space, and then it’ll be time to go. I believe you said it’ll be $60, I imagine that being for the whole night. If you’re not planning on staying all night, is it still $60?